The Vatican needs no introduction. Being the centre of the Roman Catholic Church, the Vatican City state is the smallest country in the world. Home to numerous religious and cultural sites, the city also treasures a priceless collections of artistic and historical masterpieces that a million flock to catch a glimpse of. Before you set off to visit the Vatican Museum, here's all you need to know about the Vatican entrances. There are a few many entrances and chances are google may mislead you if you don't feed in the exact thing. Hence, here's our guide, simplifying the Vatican Entrances for you. Which Vatican Museum Entrance Should I Look For? Before looking at the Vatican entrances, let's look at how you can reach Vatican City. 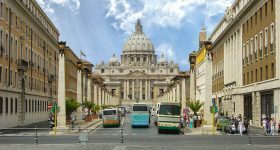 Depending on your preferred mode of transport, you can reach the Vatican city via bus, metro, tram or taxi. On this map below, we have marked the closest bus stations, metro stations and tram station that you can disembark to reach the Vatican Museums and St. Peter's Basilica by foot. The Vatican Museums, accessible from Viale Vaticano on the North side of the city state, hence, if you're visiting the Vatican Museum first, we would suggest the below route to reach the entrance. If you're coming by bus to the Vatican Museums, your best bet it Bus No. 49 Look out for Viale Vaticano stop and hop off. You'll see the Vatican Museum's Arch right in front of you. Alternatively, you could use Bus No. 492 or Bus No. 990 and hop off at the Via Leone IV stop. This one's a quick 5 minute walk from the Vatican Museum entrance. The closest Metro to the Vatican Museum entrance is Valle Aurelia. From here, the museum is a 5 min walk. If you're coming via the tram, know that there's only one tram that stops at the Vatican City. Tram 19 stop at Piazza del Risorgimento and from here, you can take a quick 10 minute walk to the Vatican Museum entrance. St. Peter's Basilica, on the Southeast side of the city and accessible from Via della Conciliazione. If you're visiting the St. Peter's Basilica first, here's the route we would suggest. If you're planning to arrive via bus, you have two options that stop on either side of the Basilica. Bus No. 32, 81, 982 stop at the Piazza del Risorgimento which is a 10 minute walk from the Basilica. This stop lies to the left side of the Basilica. Bus No. 64 stops at Via di Porta Cavalleggeri and lies to the right side of St.Peter's Basilica. This is slightly closer than the other bus stop, however, depending on which bus plies your route, you can opt for either. Bus 64 is one of the most used lines in Rome as it connects Termini station with the Vatican City, stopping at key sites such as Piazza Venezia or Largo Argentina. Be prepared for a stuffy bus! The Ottaviano Metro Stop is closest for those looking to head to St. Peter's Basilica. The Basilica's entrance is a brisk 10 minute walk from the metro exit. Like I mentioned before, there is only one tram stop in Vatican city. Tram 19 stops at Piazza del Risorgimento and a quick 13 minute walk should have you at the Basilica's entrance. Great question. Chances are you'll see three lines swarming with tourists, waiting to get inside the Vatican Museum. You'll notice that one of the 3 lines are really long. Probably even winding down the corner, around the wall; similar to the image below. This is the queue for those who have not purchased tickets online and are waiting to purchase them on-site. Honestly, this is a bad idea. These queues can go on for 2 hours, especially during summers and peak season. You might just be so drained and tired by the time you reach the ticket counter, you'll probably want to just leave the line and grab some cooling gelato. If you planned to get tickets on-site, it's still not too late. Grab discounted online tickets to the Vatican Museum and Sistine Chapel here. With online tickets, you can stand in the queue that starts near the yellow signboard. These lines are for online ticket-holders and are much shorter and move rather quickly. For the record, Skip the Line tickets do not let you bypass the security queues. It only lets to bypass the long ticket queues that are winding down the walls. For your reference, here's a picture of what you should lookout for if you have purchased online tickets. If you have taken a guided tour, you will be required to meet your guide/group at a specific meeting point. From here, you will be ushered into the Vatican Museums via a third line that is most definitely the fastest and most efficient way of entering the Vatican Museums. The queues to the farther right of this image below belongs to those with guided tour tickets. The ones with the orange flags being the held. Since they are group entries, they move real quick. If you can't remember the names of the metro station, you’re in luck – they’re labeled as “Ottaviano-San Pietro” and “Cipro-Musei Vaticani,” so they’re hard to miss. Bus No 64 is notoriously famous for its pick pockets as it is mostly frequented by tourists. Keep your belongings close. If you are looking to walk to the Vatican, I only recommend doing that if you are already in the center of town ( do not attempt walking from the Colosseum). 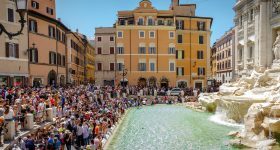 It is a 1.5 hour walk from Trastevere, Piazza Navona, the Pantheon, the Spanish Steps, and Piazza del Popolo, and only a stone´s throw away from Castel Sant´Angelo. Guided tours make your Vatican visit a whole lot easier. 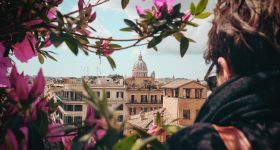 You can hit up the Vatican Museums and Basilica without the queues and a local guide by your side. I think it's definitely worth the extra few euros. 7.00 a.m. – 7.00 p.m. Though entrance to St. Peter’s Basilica is free, entering the Vatican Museums isn’t. But be sure not to miss the latter, for the historical and cultural significance of both are equally important to getting the full experience. 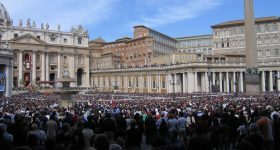 Ensure that you visit the Vatican early in the morning to avoid long queues, and then walk twenty minutes to the Basilica. The latter is also closer to the city, making it easier to exit. Investing in a guide book may come in handy, for a lot of the charm of these monuments is their historical significance. It may also help with directions – it can get confusing inside! Visiting both the Vatican Museums and the Basilica could take around 6-7 hours, so plan your meal times accordingly.